Colour play from the sketch book. I want to share with you some colour sketches form my sketchbook. I always draw out a design and colour it before transferring it onto fabric. Usually I will play around with a few variations and colour combinations before picking up a needle and thread. 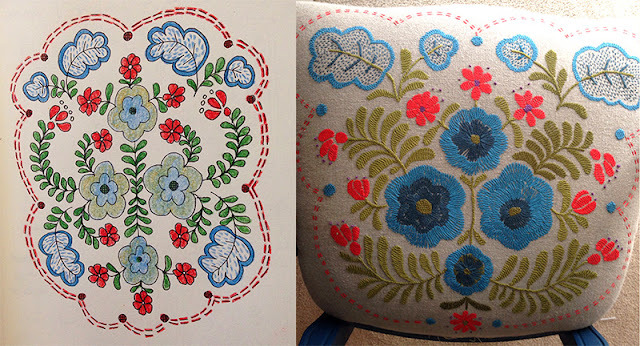 Below is the original colour sketch and then the embroidery that was born from it and went onto a chair seat. And at the bottom are some current sketches with no embroideries made from them yet. If I use any of them for stitching I'll be sure to share the finished piece. I hope you find some inspiraiton here. Please send me any photos of sketches and embroidery if this is also your process. I would love to see!